Store/s is this week's Mommy Moments theme. Here are some different store photos of my daughter over the years. Our favorite store to go to is the grocery store of course! These photos were all taken in California. She don't want me to take a picture of her...lol! This is my entry for Mommy Moments this week. Ang aga hehehe, first honor ka sa MM, gagaraduate kang magna cumlaude nyan sis weeee... Love ko yang last shot ni Akesh, her grin is something ornery hahaha. Akesha is really a beauty to behold. She makes your photos so refreshing and exciting because of her. 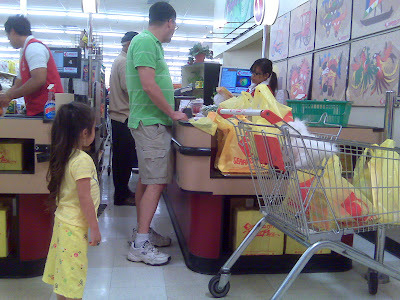 That she is always accompanying you and your hubby every time you buy your groceries is not surprising, hehehe. Thanks for the post. God bless you all always. i agree to anne, super laki tlga ng grocery store diyan parang ang sarap mamili heheh! I miss going to a U.S. commissary! I know you can buy really good stuff there that are all tax-free. Nice seafood store, too. Way different from our local 'palengke'. I hope you can drop by my blog, too, and check out my MM entry. It's at http://www.anaturalmama.com/2011/07/my-top-5-favorite-stores.html. Thanks in advance! Have a great weekend! Akesha's really cute! Nahihiya pero cute pa ren. as usual, prettiness kaayo ang little grocery shopper ay! 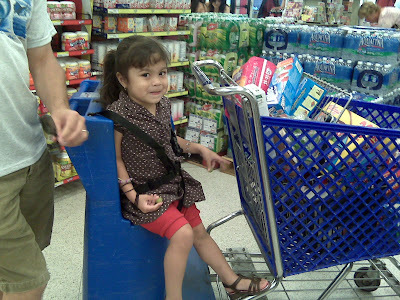 :) lots of grocery shopping photos u got there dhemz! ako kay i only have one or two siguro ka shot of triz nga gasakay sa cart kay never jud ni sya mosakay sa cart, di sya ganahan! lol. mo-prefer jud ug baklay ning taga-bukid! hahaha! Those push carts are brilliant! I liked them. Here's my share. Happy MM. mana impake bayot? im sure mana ky tugbong namu ugma sa disneyworld hehehe. weee. kalami ninyo uy, ayaw kalimut ug hapit nku diri ha ehhehe. i bet groceries will be a hit this week!